This blog post is co-authored by Joachim Hafner, Cloud Solution Architect, Microsoft Azure. 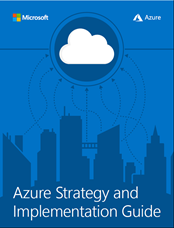 We’re pleased to offer a free e-book for those of you who are new to Azure or in the beginning stages of planning a cloud migration: the Azure Strategy and Implementation Guide for IT Organizations. As cloud solution architects, we hear a lot of the same questions from customers who are starting to think about their cloud implementation process. This motivated us to write this e-book, which provides guidance in the form of a blueprint which customers can follow to help form their cloud strategy. Chapter 1: Governance – This chapter covers the starting points, from the aspirational “digital transformation” to the important tactical steps of administration and resource naming conventions. Get an overview of topics such as envisioning, to cloud readiness, administration, and security standards and policy. Chapter 2: Architecture – This section takes a longer look at security, touches on cloud design patterns, and provides several visual representations to help you understand network design. Chapter 3: Application development and operations – Here, we cover backup and disaster recovery, as well as application development from an IT operations and management perspective. You’ll learn about the culture of DevOps as well as monitoring and Infrastructure as Code (IaC). Chapter 4: Service management – No, IT does not become obsolete when an organization moves to the cloud! This chapter focuses on service management and optimization, along with the day-to-day details of how to stay informed of the Azure roadmap, updates, and where to go when you need support. The target audiences for this guide are enterprise architects, project managers of cloud roll-out initiatives, solution architects, and IT team leads. We hope you find it helpful! Get your copy of the free e-book today.